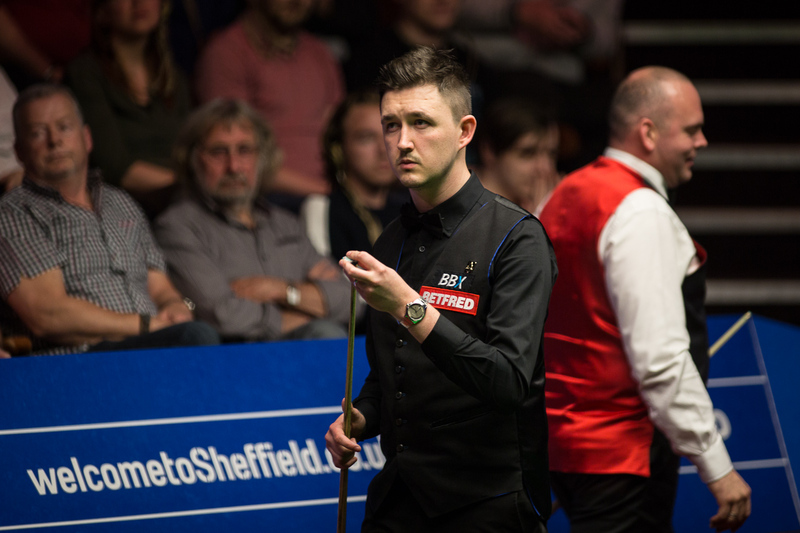 Kyren Wilson reached the quarter-finals of the Betfred World Championship for the second consecutive year with a 13-10 defeat of Stuart Bingham. 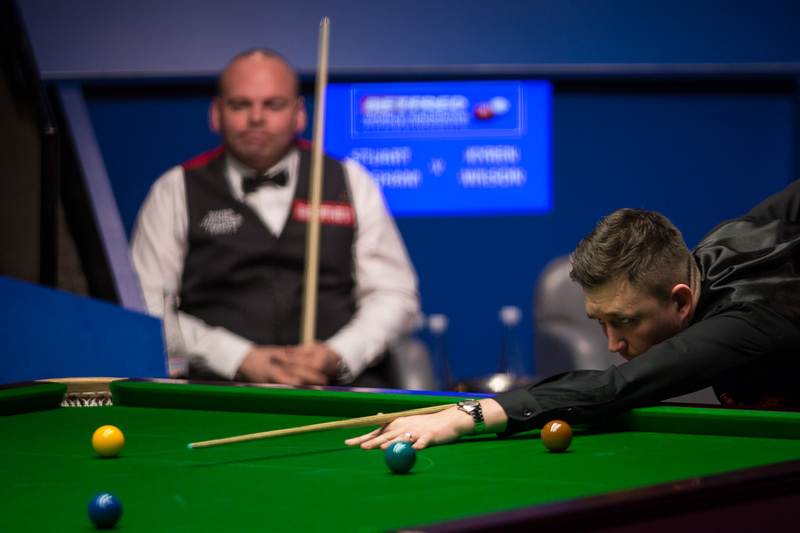 Rising star Wilson, competing as a seeded player for the first time having climbed into the top 16, is the first man into the last eight at the Crucible and will now face John Higgins or Mark Allen on Tuesday and Wednesday. Kettering’s 25-year-old Wilson lost to Mark Selby in the quarters last year then stated that he would return to win the title. Full of self belief and armed with a superb cue action, the player nicknamed the Warrior will be a handful for any opponent. He took control against 2015 World Champion Bingham in the early stages, building a 5-0 lead. Bingham might have made it 8-8 at the end of the second session but Wilson won a vital 16th frame to give himself a 9-7 advantage going into tonight’s conclusion. World number 14 Wilson took the first frame tonight with a break of 63 before third seed Bingham hit back with a 137, the highest break of the tournament so far. A scrappy 19th went to Bingham as he closed to 10-9 before Wilson pulled away again as runs of 59 and 88 helped him go 12-9 in front. Bingham potted ten reds with blacks in frame 22 before missing a tricky red on 80 to dash his hopes of a 147. And the Basildon cueman’s hopes of progressing further in the tournament also soon died, as a missed pink when he trailed 44-7 in frame 23 gave Wilson the chance to add the points he needed for victory. Wilson, who won his first ranking title at the Shanghai Masters last season, said: “I learnt a lot from last year, it made me feel very comfortable as soon as I stepped through the doors for my first match this year. I don’t have a bad record in my three years here, long may it continue. “There’s so much history and memories here, as soon as you step through the doors you’re just in awe of the place. Growing up watching it as a kid, I dreamed of playing here. “In best of 25 matches, you’re never comfortable even at 5-0, I probably should have gone 6-0. Stuart has shown what a great champion he was fighting back at me. “He got to within one on a couple of occasions, I kept trying to pull away and I held myself together well in the last frame. Bingham said: “At 5-0 down I was getting frustrated with myself, I felt Kyren was getting the run of the balls, it seemed everything was against me. I just couldn’t catch him up after that. “Fair play to Kyren, he’s a great player and he’s got a great cue action and his long potting is really good. “When he made a break to go 12-9, I was looking around thinking this is the Crucible Theatre, I love the place, it’s the only place to end the season. Obviously I wish I’d of gone a couple of matches further. What I did here two years ago will be with me to the grave. “Kyren has a lot to learn, he relies on his cue action. He’s obviously young and confident but it baffles me sometimes – the shots he plays. He’s got a great future in the game but whoever he plays next time he will have to improve. Meanwhile, Ding Junhui’s lead over Liang Wenbo was trimmed to two frames and they will go into the last session on Saturday with Ding 9-7 in front. Liang won the first two frames of tonight’s session with breaks of 84 and 75 to close to 6-4. A high quality contest saw Ding hit back with 91 before Liang made a 130, missing the final pink when he looked set for a 143. 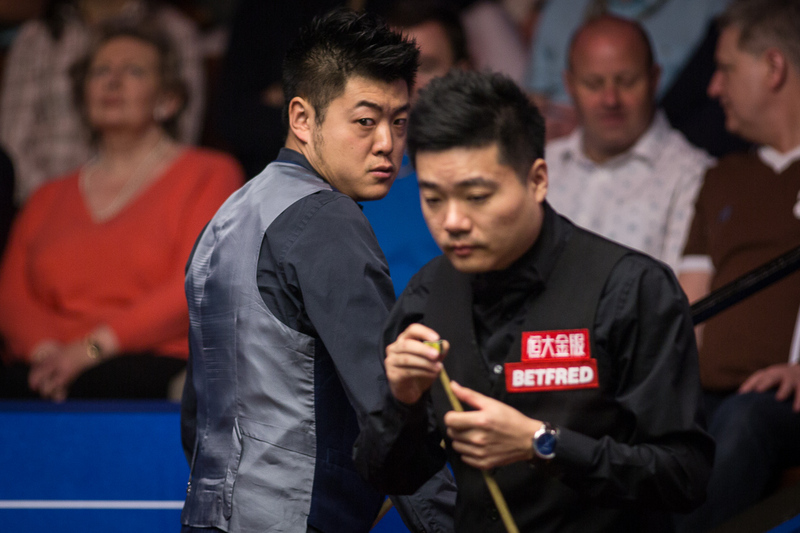 Last year’s runner-up Ding came from 51-0 down to win frame 13 and go 8-5 up, then Liang made a 79 to take the next. Ding’s 94 made it 9-6 and he had first chance in the final frame of the session but missed the green to a baulk corner on 27 and his opponent hit back with 36 and 39 to narrow his overnight deficit.